Sweet or savory, which would you choose? Snack attack! When my son comes home from school ravenous (always!) and I realize I don’t have enough on hand for a big lunch, we make a big plate of Jilz Crackerz with toppings. Fruit on So Delicious Coconut Yogurt, veggies on Tofutti Brands Better Than Cream Cheese. Which would you choose: sweet or savory? Or both, like I do? A special thank you to Jilz Crackerz! I won these crackers in a giveaway and can’t say enough about them! They are gluten-free, grain-free, vegan and paleo – but the real reason we love them is they taste AMAZING, and don’t fall apart when you eat them! If you’ve ever had a gluten-free cracker crumble to bits you know how huge this is! 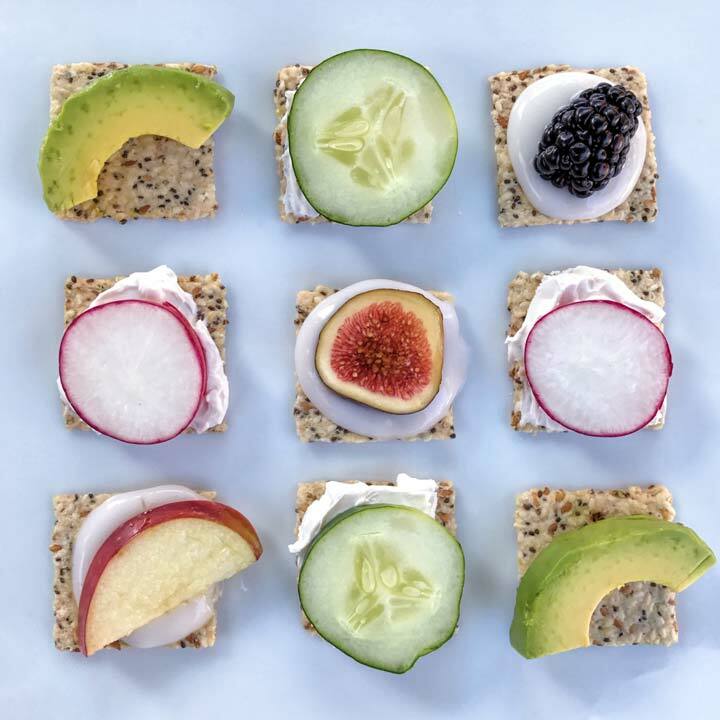 These tasty snacks are made from Jilz Crackerz with various toppings, including assorted fruits on So Delicious Coconut Yogurt, and assorted veggies on Tofutti Brands Better Than Cream Cheese.